The Rebel Sweetheart. : Pandora Spring 2014 Collection | Of Flowers and Butterflies. Pandora Spring 2014 Collection | Of Flowers and Butterflies. Flowers begin to blossom and fill the air with their fragrance as Spring comes again with a promise of joy and new beginnings. Butterflies emerge from their cocoons and start to stretch their wings as they flutter from garden to garden, celebrating their new-found beauty. The young girls come out to enjoy the heat of sun as the breeze blows past their lacey dresses. Ah yes, Spring has definitely sprung. PANDORA’s Spring Collection 2014 celebrates the season with their collection of elegant and classic designs. Pastel shades of my favorite colors - lavender, pink, purple, and blue - bring life and a touch of femininity to the intricate pieces of this season. The collection features figures such as silver dangle butterflies with cubic zirconia, silver daisies with white enamel and butterfly charms with Murano glass, keeping up with the growing botanical trend. 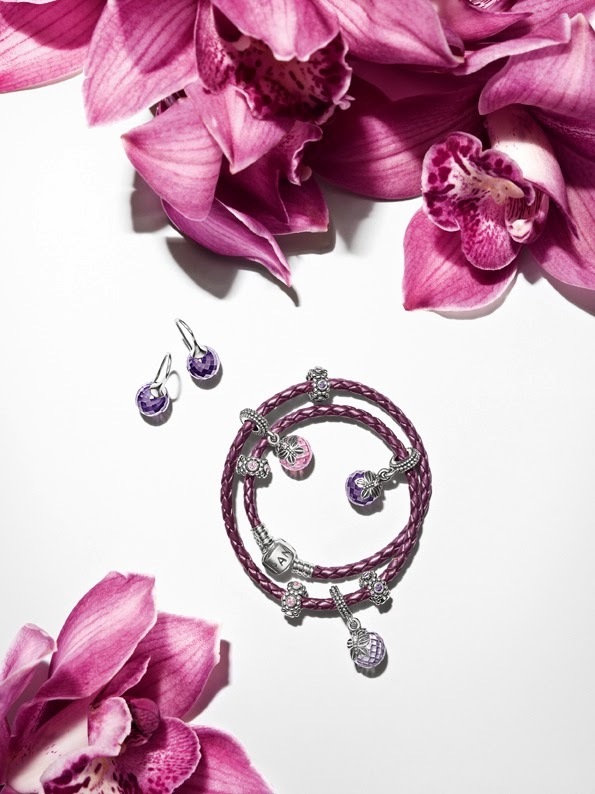 PANDORA also continues the success of their pavé charms with lavender and pink pavé balls. reimagines that of butterflies on blossomed flowers on spring. With the timeless and intricate designs that come with the adorned charms and jewelry that PANDORA’s Spring Collection 2014 offers, PANDORA invites you to celebrate femininity and delicate elegance this season. to the popular silver pave' ball charms. The Pandora spring collection will be available in stores starting March 13, 2014, and can be found at Adora Greenbelt 5, Glorietta 4, Bonifacio High Street Central, Newport Mall at Resorts World Manila, The Podium, Shangri-la Plaza East Wing, Megamall Building D, Elemento in Aura Mall, and Century City Mall (opening March 2014). Spring has sprung at PANDORA. World-renowned for its high quality and hand-finished jewellery at affordable prices, PANDORA designs, manufactures and markets modern jewellery made from genuine materials. Inspiring women to embrace their individuality and express their personal style, PANDORA’s romantic and feminine jewellery captures the unforgettable moments of life. PANDORA’s unique and detailed designs combining traditional craftsmanship with modern technology are sold in more than 70 countries across six continents through approximately 10,000 points of sale, including more than 900 concept stores. Founded in 1982 and headquartered in Copenhagen, Denmark, PANDORA is publicly listed on the NASDAQ OMX Copenhagen stock exchange. For more information, please visit www.pandoragroup.com or be inspired at www.pandora.net. Dream ko maka afford nang Pandora. I will definitely save money to be able to afford this. My husband gave me a Pandora bracelet a few years ago. I love it! Every year, he adds another charm. I'm always excited to open that box! So pretty. I would love something like that. These are so pretty! I love the pinks and purples! Beautiful bracelets. I love the colors. Very nice collection and I love the colors too. Oooh I LOVE those colors!! Yay! So Pretty! I only have one Pandora bracelet which is a hand me down from my mom! <3 I would love these new sets, perfect for the pantone color of the year! The collection is sooo me! I like butterflies and flowers. Wish to own one of Pandora's bracelets or rings soon. I would love to have a Pandora bracelet but they're too pricey for me. My niece is soo addicted to Pandora, her first bracelet feels so heavy already because of the charms & everything on it.